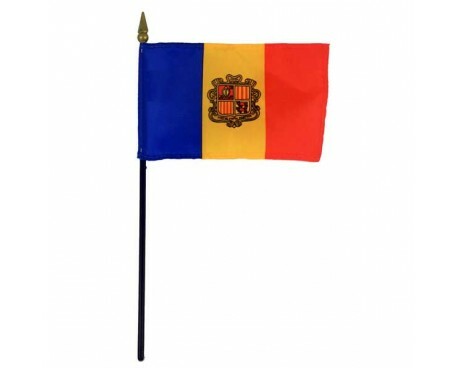 Andorra Stick Flag (with seal) - 4x6"
Andorra flags are a reflection of the nation's heritage and ancient history. 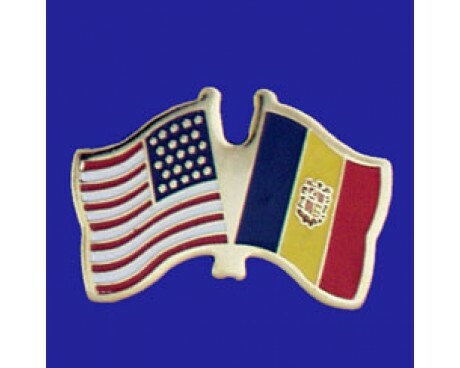 The flag combines aspects of several other flags that have been associated with the people of Andorra and their feudal rulers to create a flag that encapsulates that nation while also showing respect for the foreign powers to which it has often been tied. Andorra's national flag was adopted (in it's present form) in 1993. The blue, yellow and red tricolour has been used since the last half of the 19th century. Blue and red are the colors of France's flag, and the yellow and red are from Spain's flag. Together the reflect Franco-Spanish protection. The center image is a combination the arms of the bishopric of Urge, the counts of Foiz, Catalonia and Bearn. The motto is "United strength is stronger." 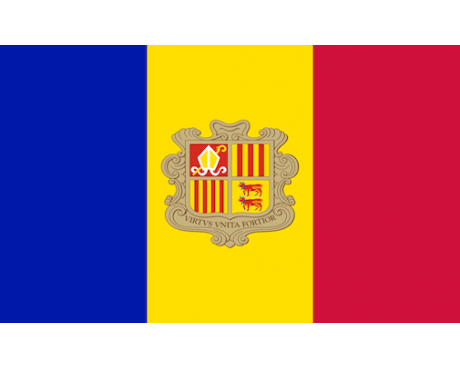 Andorra flags are vertical tricolors of blue, yellow, and red that display the country's coat of arms in the center. Unlike the vast majority of other tricolor flags that are used in Europe, the three stripes are not of equal width. The central bar is marginally wider than the bars that are next to it, in a ratio of 8:9:8. The design pays respect to the nation's past. The flag's colors are taken from the flags of France, Aragon, and Foix, which have all held the lands of Andorra at various points in the nation's past. The flag's design is also a reference to that of France, which introduced the modern tricolor to Europe during its revolution. The uneven sizes of the bars is a symbol of the nation's historical link to Aragon, which has also used that trait on some of its historical flags. The coat of arms reinforces the link to those nations. 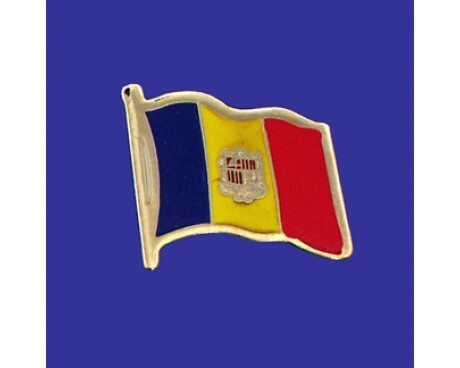 It displays a different symbol in each quarter of the design, and each one represents a historical lord of Andorra. Proceeding clockwise from the upper left, they represent the Bishop of Urgell, the Count of Foix, the King of Aragon, and the Viscount of Bearn. The Bishop and the Count were both princes of Andorra, while Aragon and Bearn ruled over it as feudal overlords at different points in the country's history. The modern flag of Andorra was adopted for national use in 1971, but it was not the nation's first flag. The nation first used a vertical bicolor flag of red and yellow to represent itself, which was adopted in 1806. A horizontal tricolor of red, yellow, and blue and emblazoned with a crown was adopted in 1866. It fell out of use in 1939, when it was replaced with a precursor to the modern flag that used an alternative form of the coat of arms.